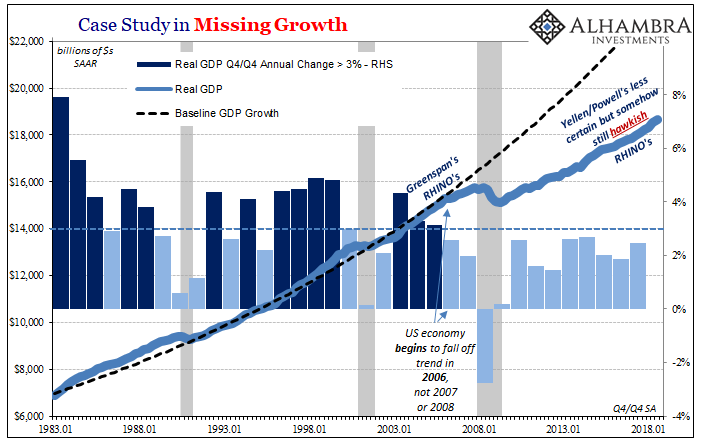 On August 30, 2006, the Bureau of Economic Analysis (BEA) reported preliminary estimates for US Gross Domestic Product (GDP) in the second quarter. It was figured back then that domestic output increased 2.9% over the first quarter, seasonally adjusted, somewhat of a decrease from the robust start to 2006. Final estimates for Q1 thought the economy had advanced 5.6% during those three months. These were comforting numbers for financial markets increasingly shaken by financial factors. Anecdotes about housing imbalances were plentiful, of course, but more so there was a growing and obvious objection to Alan Greenspan’s sunny view of everything. The FOMC had begun to “raise rates”, that is, the Federal Reserve started a series of seventeen 25 bps adjustments to its one target for the federal funds money market rate, all the way back in June 2004. 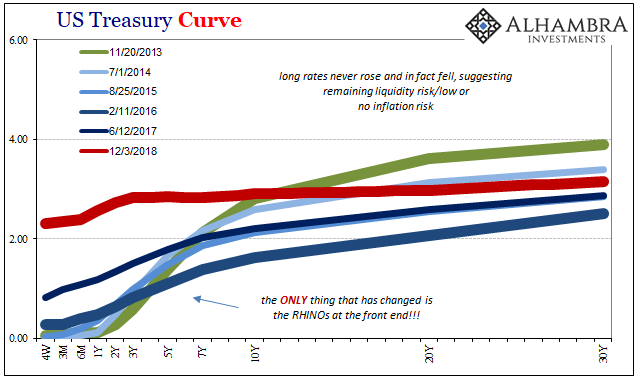 The long end of the UST curve wasn’t buying the rationale behind the policy shift. Thus, over those many months the Treasury bond curve flattened out and then in December of 2005 it inverted. The “maestro” called it a “conundrum” when it was anything but. The market, the most important market in the world, flat out disagreed with the Chairman. He just didn’t care. Central bankers don’t actually believe in markets, they believe in their statistical models. When the BEA issued forth its statistics on the economy, policymakers thought their math had been checked and they were right about everything. A bunch of wet blanket Cassandras among UST investors weren’t going to spoil the successful engineering of recovery from the perilous dot-com bust. Buoyed by this imagining, officials entered 2007 supremely confident. Very quickly everything would change, however, wherein the FOMC hurriedly and more desperately found that it had been wrong and was then behind events taking shape much faster than they could respond (let alone understand anything so as to respond effectively). The UST market was right all along. Do we take from this example the literal retelling of history? What I mean is plainly obvious given recent events. The UST curve has this week inverted again, though small and only in one piece of it (between the 3s and 5s, though the 2s to 5s is zero and intraday slightly negative, too). People look at it like December 2005 and may feel slightly comforted by the fact the crisis was several years further on before it materialized. By the curve trading in December 2018, should we expect recession in or around May 2020? Isn’t that plenty of time for Powell and the current FOMC to get their act together and avoid it? No. Problems are much more immediate than that starting with the measurement problem. The BEA thought the economy was doing well enough in early and middle 2006. Over the years, though, they’ve changed their assessment. As of right now, the government believes GDP growth was strong in Q1 2006, 5.28607% Q/Q, but then nearly a recession in both Q2 and Q3. Real GDP expanded by less than 1% in each of them. 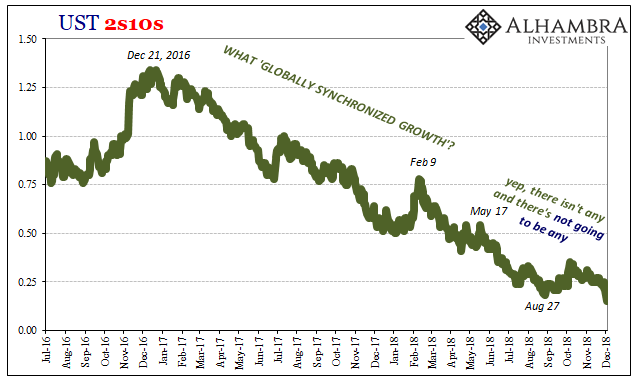 The economic downturn which eventually led to all the things we remember had begun within months of the UST curve flattening and inverting. And that was with an actual growth period behind it. We have no such thing today, no matter how many times you hear about this economic boom. In other words, the US (and global) economy starts off this period of uncertainty already having been a decade languishing without growth. 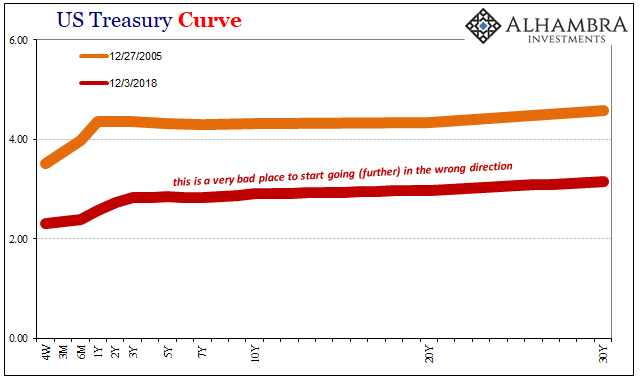 This is the part of the UST curve nobody talks about; as I’ve written constantly, it’s not just that the curve has flattened and now inverted it is where this has taken place in the nominal spectrum. The only thing that has changed about it over the last several years is the FOMC’s RHINO’s at the front end. Despite so many efforts to create a real BOND ROUT!!! !, the back end has largely stayed in the same general area. Nominally, the UST curve has always projected this constant, underlying economic uncertainty. Therefore, the turn toward inversion merely means heightened uncertainty. If the economy in the middle 2000’s downshifted after from middling growth to no growth and then significant crisis, what happens when we downshift starting from no growth? The timing start to finish may already be condensed. We are, I believe, about to find out. Like the eurodollar curve inversion, these deep, important markets are saying that trouble isn’t out there in the distant future it is right here, right now. Any big, enormous consequences of these monetary disturbances might be that distant, but the road toward them is being laid down and paved today. In one sense, the inversion gives off an inevitability to all this. Central bankers don’t have any answers because they can’t even ask the right questions. They are irrelevant, which is why the nominal placement of the UST curve matters more than Jay Powell’s fixation on the unemployment rate. Flat and inverting at 4.5% is one thing, doing it at less than 3% is quite another. Like Greenspan, Powell is already in deep trouble, not that he would know it. Whatever small window for optimism coming out of 2017 was slammed shut on and around May 29 this year. Focusing on the inversion of the curve as it might relate to the distant future is a mistake, the same one Greenspan made. There is a lot of bad stuff going on right now. The big problem the low 2018 curve points out is that even if Jay Powell were to experience an epiphany tomorrow, the chances of something good coming from it are just as small if not nil. 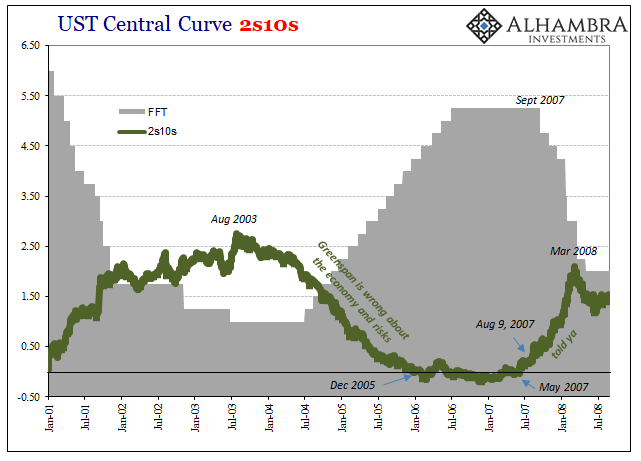 Should Powell’s awakening lead to an official heeding of the UST curve for once, so what? He and the FOMC are so far behind (the curve) the only thing they would do in response is halt maybe even reverse the RHINO’s. They still believe federal funds is a relevant setting. Since “rate hikes” are never the problem, stopping them cannot be the answer. This is what I mean by inevitability. After eleven years, officials don’t know near enough about what’s actually wrong to offer any meaningful solutions. That’s the flat sub-3% curve right there. And once the system starts to tip back toward all the negatives, there’s really nothing to stop it and correct the course. In a general sense, you can at least appreciate what’s driving these curve mechanics. Bad things are happening right now and it is likely we won’t know the full extent of these bad things and the consequences they force upon the world for several years. It’s the same as 2014, 2011, or 2006. Downturns are processes, and the next one started months ago. That’s really what the UST curve, like the WTI curve, is and has been saying. 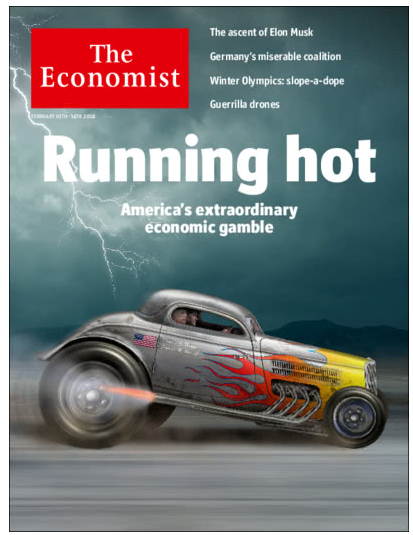 Recession in 2020? We have to get there first.